We often think or hear of the MOOC as the great equalizer of higher education, a medium to disseminate college-level education to billions, regardless of their income bracket. But recent events should lead us to reconsider this overly-optimistic perspective. In January 2013, just after the announcement that San Jose State University planned to partner with Udacity to create open, online courses for its students, New America Foundation’s Director of Education Policy Programs, Kevin Carey, claimed, “A well-regarded public university giving credit for free or inexpensive MOOCs . . . is like a crack in an enormous dam.” According to an excited Carey, if one college began accrediting MOOCs, many would follow, which in turn would shake the world of higher education by dramatically reducing costs nationwide. Crow is not alone in fearing that group segregation will result because of MOOCs. University of Nebraska Professor, William G. Thomas, expressed his disapproval of Thomas L. Friedman’s opinion that MOOCs were the cure for special-needs learners, claiming that simply giving them a link to an online course will segregate them from children with “normal” learning needs. “The frightening and retrograde idea that people with special needs can be set apart (to be special somewhere else) should be seen for what it is—exclusionary.” Professor Thomas is currently working on his own MOOC-like course on History Harvests, a project he helped create at Nebraska to “democratize” American history. Meanwhile, San Jose State announced earlier in July their decision to discontinue their courses with Udacity, as students failed at alarming rates. The university plans to continue their partnership with edX, which devised courses that merely supplemented traditional, in-class learning. Reports show that less that 51% of students enrolled in the Udacity program at San Jose State passed their courses, while students enrolled in the edX hybrid program faired better even than students enrolled in traditional classes. With the recent failure (and success) of the San Jose State experiments, it appears that Crow was wise in cautioning against the full implementation of MOOCs in place of traditional, in-class learning. If the mission of MOOC-makers is truly philanthropic, they need to consider the full consequences of their endeavors. Weighing the Cost of MOOCs: Is it Worth the Expense? MOOCs are supposed to be free, but it appears that for universities and professors, that is hardly the case. Massive Open Online Courses (MOOCs) have so far proven to be a huge financial commitment for institutions and according to recent studies, the preparation can be very time consuming for the educators who build them. The Chronicle of Higher Education has been reporting that MOOCs have been quite expensive for universities. MOOC provider EdX apparently charges $250,000 per course, and then another $50,000 every time the course is offered (April 29, 2013). EdX also keeps part of the revenue generated by the profits of each course. To use the “Coursera platform”, another MOOC provider, The New York Times reported that universities would have to pay $8 per student enrolled, and $30-$60 per student to use content developed at a different school (May 30, 2013). In a class of 1,000+ students, those numbers really add up. Such prices show that creating a MOOC is a large and risky investment for any educational institution. As a result, many people, such as writer for The Chronicle of Higher Education Jason Mittell, believe that these investments will only be possible for elite institutions. While many are jumping on the MOOC bandwagon now because it’s new and exciting, these commitments may cause it to get old in a hurry. With such high costs in money, time, and labor, it appears that MOOCs may not be worth the effort or risk. Universities must be willing to pay both for the course itself, and a higher compensation for the professors that teach them. Without this, the much talked about “MOOC revolution” will become nothing more than a moment in history. The first day of class—most people know what that experience is like: Nerves—Am I in the right place?—Excitement—I’ve heard this professor is really good—Curiosity—Who are these people sitting around me? As an undergraduate student of European History at Dickinson, I’ve only ever had Professor Pinsker once, for a methods course which met once a week for a three-hour period. I had heard from the upperclassmen that he was an intimidating professor, one of those who forced you to really defend and question your opinions. Both excited and nervous, I arrived over ten minutes early with all the course materials in my book bag and the reading printed out. As my classmates trickled in, I recognized some of them and made immediate judgements about the others. One or two people were conversing with each other but no one tried to start a conversation with the entire class. At five past, the Professor walked in, sat down between two students (we were in a seminar-style classroom), and introduced himself. We did what you usually would on the first day of class: review the syllabus, discuss the course aims, and ask a few questions before being dismissed early. It was what every student expects from their first day of class. Last night, I had the opportunity to attend another first class led by Professor Pinsker, but this time, it was very different. 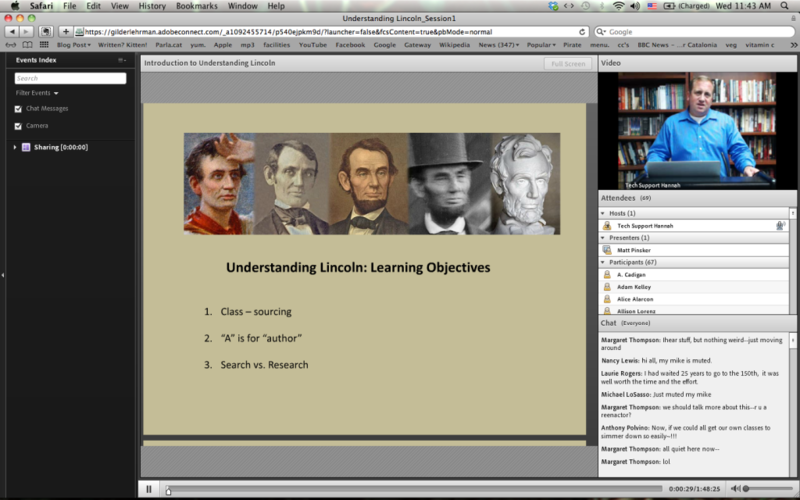 Yesterday was the launch of our online course, Understanding Lincoln, and I virtually attended the first online seminar via Adobe Connect. It ran from 7-9pm EST and was exclusively for the graduate-level students who had paid to take the course (though the free participants were able to watch a half hour after its conclusion). I will admit, I was a bit skeptical going in. I didn’t think it would be at all comparable to a traditional classroom, having participated in other MOOCs and finding it not that compelling to watch a professor lecture on a screen. Well, I was right, and I was wrong. It certainly wasn’t a traditional classroom, but it was surprisingly engaging. I entered the “classroom” three minutes late, having had computer difficulties, but no one noticed. The flexibility of the program allowed participants to come and go as they needed to, and up to 70 students were present by the end of the session. The setup included a shared screen with the professor, a live feed of him at a lectern, and a chat window where participants could ask questions and comment on what the professor was saying. Although the professor couldn’t read them, Gilder-Lehrman’s Education Coordinator, Lance Warren, moderated the chat box and communicated the best ones to him. Although it was by no means a traditional classroom, I was intrigued to find that there were some key overlaps. Even though I couldn’t see my fellow students, I still found myself curious about who they were and where they were from. I kept making judgements about their personalities. Kory L. reminded me of an awesome high school teacher I had, while James G. was obviously a snarky Lincoln-skeptic. I could tell when participants were excited to talk or nervous to ask questions, just like on the first day of class. What’s more, Adobe had a “Raise Your Hand” feature, where a participant could ask a question of the professor directly. Clicking that button would put them in a queue, which Lance would access and enable their mics. Aside from the technical difficulties some participants experienced, it was very much like asking questions in a traditional classroom, and I think that alone could be said to have revolutionized the online lecture. There were a few adjustments that could be made. For one, I’d prefer the live feed of the professor to be larger. Some of the time I felt distracted by other things on screen, and I found I was able to pay more attention when I was watching him speak. If he can’t adjust the size of the video, he might try to do more interactive things with the shared-screen as he lectures, especially bringing up text as he reads it. And while I do feel that the live chat was a great tool, I would suggest encouraging students to utilize the private chat more for trivial comments. I assume that will happen more often as participants get to “know” each other, but last night some of the comments were more distracting than helpful. I know the question on everybody’s minds is how online learning might change or negate the traditional classroom. Already, from my experience yesterday, I can see the possibilities of utilizing social media sites like Twitter to replicate the live chat in the online seminar. I really appreciated this feature because it encouraged the meeker students to pose their questions, without physically having to speak up. A greater diversity of voices were heard and intellectual conversation flourished. Overall, I thought it was a great experience, better than I had hoped for. 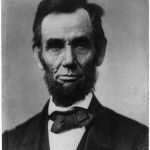 The chat box and the ability of the participants to ask direct questions really underscored the objective of this online course—to have participants collaborate to create a project that is useful to others outside of the course, to expand Lincoln’s legacy using the legacies of present-day scholars. As Massive Open Online Courses continue to gain popularity and media coverage, much of the focus has been on learning online vs. learning in a classroom. However, just as important as learning itself, is how to evaluate the learning. For most MOOCs, this comes in the form of tests and quizzes. The problem presents itself mainly in humanities courses, where Professors are simply unable to grade written assignments for all the students enrolled. As a result, MOOC providers such as Coursera and EdX have developed new techniques to help solve this problem. Colorado State University Professor (and former MOOC student) Jonathan Rees wrote an article on March 5, 2013 in which he expressed his disapproval. He says in his article titled “Peer Grading Can’t Work“, that while peers often grade accurately, it is the comments that truly matter, and are unfortunately often sub-par. He stresses how learning from mistakes on tests are fundamental in college education, and is unsure whether MOOCs can deliver helpful responses. Rees states that this will not impact those taking MOOCs simply for expanded knowledge, but “its victims will be the future students who take MOOCs to earn college credit.” To him, these students will be deprived of the necessary instruction on writing, argument forming, and the appreciation of literature that are necessary for success. Both of these articles show that while the ability of MOOCs to accurately grade papers is still developing, it may be on the rise. Although they are likely to remain imperfect, will MOOC grading nonetheless one day become effective? Or, will the absence of Professors in this vital area create a hole that will eventually sink the entire ship? New York Times columnist, Thomas Friedman, has always touted his enthusiasm for the MOOC, calling it a “revolution” to sweep the status quo of higher education. In January of 2013, he wrote that MOOCs have the ability to extend access to higher education to the most remote areas of the globe, going as far as to claim that MOOCs could have serious, positive effects on US foreign relations. He suggested that the US “rent space in an Egyptian village, install two dozen computers and high-speed satellite Internet access, hire a local teacher as a facilitator, and invite any Egyptian who wanted to take online courses with the best professors in the world, subtitled in Arabic,” all for very cheap. There are many who don’t share Friedman and Coursera’s enthusiasm for the global reach of MOOCs. 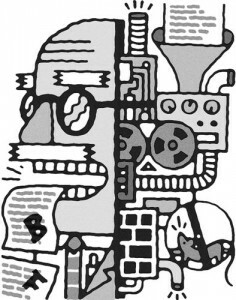 In September of 2012, Jason Lane and Kevin Kinser warned of the prepackaged and standardized format of the MOOC, calling it the McDonaldization of higher education, and Ghanashyam Sharma wrote last Monday, July 15, “The excitement about the unprecedented access that people around the world now have to education from places like Harvard and MIT overshadows what should have been a topic of serious conversation: the intellectual barrier in spite of technological access.” Both pieces, written for the Chronicle of Higher Education, warned that most MOOCs created in the US by US professors are only perpetuating a “wave of intellectual neo-colonialism,” in which geographical areas lacking in first-rate education are fed Western ideas that are in all likelihood incompatible with local cultural understandings and even methods of learning. Furthermore, online learning imported from the US could seriously damage progress of developing brick-and-mortar institutes of education and cultivating local teachers in third world countries. While it is undeniable that the prospect of opening higher education to the world is inspiring, these words of caution must not go unheeded. Is there a better way to democratize education than simply mass-distributing the opinions of elite American professors? Can some sort of collaboration occur between professors of American universities and universities around the world? Hybrid Learning: Detriment or Enhancement? Along with the growing popularity of MOOCs, has come a rising debate in regard to their effectiveness. It seems that there is a constant comparison between learning in an online environment and learning in a classroom environment. However, as several new articles suggest, perhaps the best solution can be found in a “hybrid” or “blending” of the two. But does blended learning actually work? What would this mean for the future of education? Steve Kolowich’s article for The Chronicle of Higher Education in May of 2013 examines the issue in light of recent protests from university faculty members. San Jose State philosophy professors wrote an open letter in which they stated their refusal to use MOOC material from well known Harvard professor, Michael Sandel, in their classrooms, claiming that students would have neither “self-paced learning” or the “responsiveness of a professor” who caters to the needs of specific students. Kolowich points out that the professors were not opposed to the technology itself, but rather to the important principles of their teaching that this collaboration could destroy. In particular, they feared that universities would “use those materials to phase out local departments and professors.” Although San Jose State said that they plan to let professors have control of the MOOC content, the professors themselves remain skeptical. Another Chronicle article written on the same day by Oregon State associate professor, Andrew Valls, also examines the San Jose State protests. Valls sees the letter as too black and white; it only addresses the difference between strictly online learning and strictly classroom learning. He insists that true hybrid learning is a combination of both, and while nothing will replace classroom learning,online components could provide many advantages. Not only are they convenient, he writes, but sufficient online lectures allow professors to “rethink how we spend our time in the classroom,” spending less time lecturing and more time engaging the students. Valls also doubts that only elite universities can provide successful online content. “Anyone with a computer and an Internet connection” might create a MOOC, lending more varieties of lecturers and courses to the world of online education. Valls is right in saying that everyone has the opportunity to produce online material, but it is also true that not all material carries the same weight. A course taught by a Harvard professor and one taught by a community college professor would not be comparable, although thanks to MOOCs, both would now be at the same price. However, as Laura Pappano notes in her November 2012 article, teaching ability is also a factor. Perhaps credentials will become less important as MOOC instructors are sought not for their research, but “because of how they teach.” It is a combination of these two factors that may ultimately change the face of education, making hybrid learning a detriment for some, and an enhancement for others. In recent media, that has been the question. Although the average completion rate of a MOOC is around 10% (which, for a class of 160,000 students, is pretty good), many in higher education have pointed out there is more to mastering a subject than just simply completing a course. 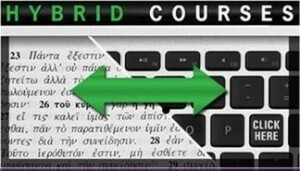 How comfortable are universities with accepting MOOC credits on a transcript? And, perhaps more importantly, how comfortable are employers with hiring applicants who received their experience online? In the first half of this year alone, it already seems like MOOCs are well on their way to being accepted for college credit. The American Council for Education has at the start of this year recommended five Coursera courses as credit-worthy, and the state of California just approved legislation requiring high school and undergraduate institutions to accept transfer credit from certain MOOCs to alleviate overfull classrooms and continue students in their degree progression. Georgia Tech has recently announced its plan to launch a completely online master’s degree in computer science. Although the program requires tuition, it’s much less expensive than enrolling in traditional courses. AT&T has pledged $2 million dollars to support the program, hoping to prepare more students with skills they’re looking for in future employees. Is accreditation contrary to the spirit of the MOOC? Of course there has been backlash to this news. Professor Joshua Gans at University of Toronto holds that accrediting MOOCs will tailor their content towards testing. Instead of allowing room for teacher creativity and class curiosity, both professors and students will be worried about what’s on the final. He claims that this is in opposition to the spirit of the MOOC, which, when they were free and credit-less, students took because of curiosity and the desire to learn. While it can be said that intellectual curiosity is a driving factor for some, aren’t most MOOC-takers looking to improve their skill sets in ways that are demonstrable to current or future employers? In these instances, some form of assessment is necessary. Are there ways to freshen up the online classroom experience while still teaching to the exam? In lieu of credit, some people are now suggesting that online students be awarded “badges” for certain skill sets they’ve learned online. Employers can look at these badges and determine if an applicant has the necessary skills they’re looking for—despite not having attended “real” college. In the same spirit, MOOCs are now showing up on resumes. This article advises students on when and how to incorporate MOOCs into their resumes and LinkedIn, and this article advises employers on how to assess MOOCs on applicants’ resumes. Accredited or unaccredited, it is becoming increasingly evident that employers are becoming more willing to consider MOOC education as a valid form of job training. On Tuesday evening, July 7, 1863, Abraham Lincoln responded to a “serenade” from a crowd outside the White House celebrating the wonderful news received in Washington earlier that day that Vicksburg had finally surrendered to Union forces (actually on the Fourth of July, Independence Day). 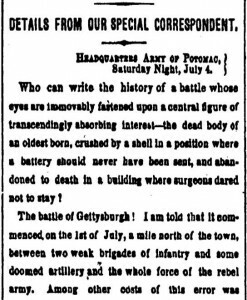 Speaking extemporaneously, the president struggled to find the right words to put the twin victories –Vicksburg and Gettysburg– into context. But there’s even more to this “first draft” story than most Lincoln scholars have acknowledged. It appears very likely that Lincoln was working at least in part from another man’s text as he contemplated how to answer that boisterous serenade on Tuesday evening, July 7. 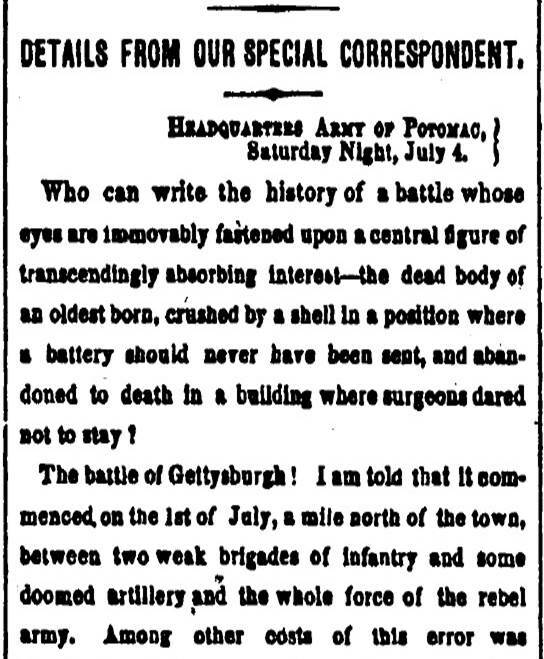 Sometime the night before or earlier that day, the president probably read and was inspired by what historian Harold Holzer is now calling “the greatest piece of war reporting ever,” a stunning dispatch from Gettysburg written by a New York Times correspondent whose eldest son had died tragically on that first day of the great battle. Who can write the history of a battle whose eyes are immovably fastened upon a central figure of transcendingly absorbing interest -the dead body of an eldest born crushed by a shell in a position where a battery should never have been sent, and abandoned to death in a building where surgeons dared not stay? Oh, you dead who at Gettysburg have baptised with your blood a second birth of Freedom in America, how you are to be envied. 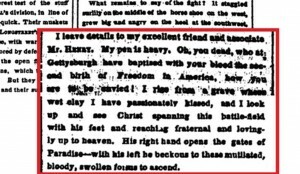 This story raises a profound question: was Wilkeson’s “second birth of Freedom in America” a line that Lincoln was recalling and intentionally evoking when he closed his own Address at Gettysburg on November 19 with the phrase, “a new birth of freedom”? The National Park Service displays relics from Bayard Wilkeson’s death, including the sash he used as a tourniquet, and they provide a text panel showing the opening of his father’s famous dispatch (later turned into a pamphlet, Sam Wilkeson’s Thrilling Word Picture of Gettysburg), but they refrain from making any direct connections between Wilkeson’s account and Lincoln’s address. Most scholars have so far been equally reticent about making that interpretive leap. I would like to speak in terms of praise due to the many brave officers and soldiers who have fought in the cause of the Union and liberties of the country from the beginning of the war … [but] I dislike to mention the name of one single officer lest I might do wrong to those I might forget. Recent events bring up glorious names, and particularly prominent ones, but these I will not mention. Perhaps the president was referring here to General John F. Reynolds or other tragic losses from the battle, but I believe this is a direct reference to the Wilkeson sacrifice. One certainly cannot ignore the fact that the sentiment Lincoln offered here of not mentioning names later became the guiding principle of his Gettysburg Address. On November 19, 1863, Lincoln mentioned nobody by name. He offered no specific details. Ordinarily, we warn students against abstractions and encourage them to be as concrete as possible in their writing. Lincoln was anything but specific in his Gettysburg Address. However, like many great writers, he was thoroughly evocative. Those last lines of the Address were especially evocative for nineteenth-century audiences, not only paraphrasing Daniel Webster’s famous Second Reply to Hayne (“It is, Sir, the people’s Constitution, the people’s Government, made for the people, made by the people, and answerable to the people” (January 26-27, 1830), but also –I would argue– paraphrasing the “greatest piece of war reporting ever” from Samuel Wilkeson. Even if we will never know the full truth behind the “first draft” of Lincoln’s Gettysburg Address, I hope more teachers see the value in bringing up this poignant and powerful story in their classrooms and letting students decide for themselves. 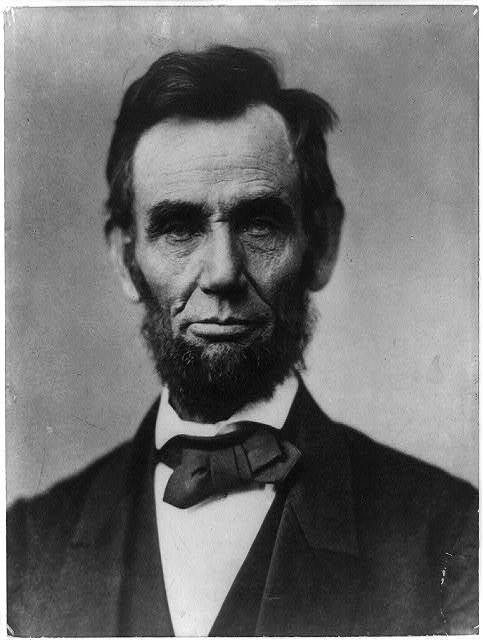 Matthew Pinsker: Understanding Lincoln: Gettysburg Address (1863) from The Gilder Lehrman Institute on Vimeo. 1. How does grading work for open, online courses, especially for written assignments? How can you prevent plagiarism and other forms of cheating? 2. What have been some of the best recent experiences for students in online learning? 3. Are MOOCs and other online courses good for some faculty and disastrous for others? 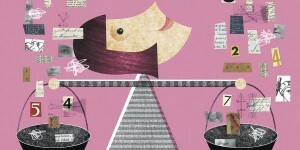 Will more extensive online learning create deepening labor problems in academia? 4. Can tools and tactics developed for online courses help with regular courses? Can they actually improve teaching? Does “blended learning” work, and if so, at which levels? Also, are “flipped classrooms” effective? 5. How should we measure achievements in online learning –by registrations? By completions? By other types of assessments? 6. Who controls the intellectual property of online content and “courseware”? What are the leading models and challenges in this new open environment? 7. How difficult is it to create and maintain effective open, online courses –in time, labor, and money? Will this space become dominated by a handful of large providers? 8. Can MOOCs lower costs, especially for undergraduates? Will open, online courses succeed in providing cheaper and faster ways to obtain credits toward graduation? Can MOOCs benefit students outside of college? Will these certificates of completion help people compete in the job market? 9. 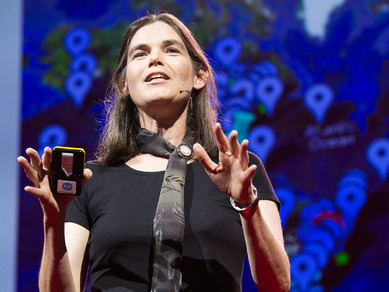 Can open, online courses achieve something new in crowd-sourcing? Can students in such courses help build and develop shared projects as part of their learning odyssey? 10. Are MOOCs really something new? What has changed –if anything– that makes them seem so revolutionary? An elderly woman approaches a table, behind which stand excited university students. She tightly clutches a stack of yellowing papers, her favorite selections from her collection of Ragtime sheet music. She’s been collecting sheet music for about sixty years, and each piece is important to her for the time and effort she spent tracking them down and the memories of her musical childhood they evoke. She eyes the students; they are young—only undergraduates—but they are polite and professional. It’s evident they’ve been trained carefully to handle historical artifacts, and so she loosens her grip on her treasures and lays them on the table; her lips open, and out pours a story of a Lost Generation, a nation divided by color but united through jazz, and plunking piano keys in the childhood of a girl who grew up in 1950s Omaha. This is what I imagine, anyway, when I, an undergraduate student of history myself, read about the collection of Janice Cleary, a resident of Omaha, Nebraska. She’s one of hundreds of Nebraskans and Virginians who’ve participated in the University of Nebraska and JMU’s “History Harvests“, headed by Professors of History, William G. Thomas III and Patrick D. Jones (of the University of Nebraska) and Andrew Witmer (of JMU). The aim of the project is “to create a popular movement to democratize and open American history” by inviting members of a community to bring their artifacts to be examined and digitally archived by undergraduate students of history. It is immediately apparent that this project has great educational significance. How many colleges and universities aim to give their students hands-on opportunities in their fields of study? I think it’s safe to say most of them. And here is the perfect opportunity, where students are handling artifacts which might never have been seen before, connecting with the community, hearing oral histories, collecting data, and categorizing it all online for the rest of the world to access. Although undergraduate students are commonly involved in the archival process (we here at House Divided do the same things), the History Harvests are unique in that they place real significance in the ordinary objects of the past. Yet it is not so obvious just how great is the project’s educational significance, especially to the realm of online education. MOOCs, or massive open online courses, are still on the up and up, and Professor Thomas has announced his plans for a “MOOC-like” course designed around the concepts of a History Harvest, to be launched in Spring of 2014. It is not clear what this online course would look like, beyond that it will be different than most MOOCs in that it will be open to professor-led classes of other colleges, rather than open to any joe-shmoe on his own in front of a computer. But can American history really be “democratized and opened” through the medium of a MOOC? Should it? Already, the course undercuts its own aims by cutting out those students who are learning at home by themselves and only allowing tuition-paying, residential college students to benefit from the experience of handling and digitally archiving the artifacts. But how many students learning on their own are qualified to handle the treasures of people like Janice Cleary? I think the History Harvests themselves are a fresh approach to teaching historical methods. It will be interesting to see how the MOOC fleshes out. And as a tuition-paying, residential college student, I’d take the class.